The early media blitz for the new No. 7 Sub shop at the Ace Hotel did it’s job, so much so that that they ran out of bread during their soft opening. 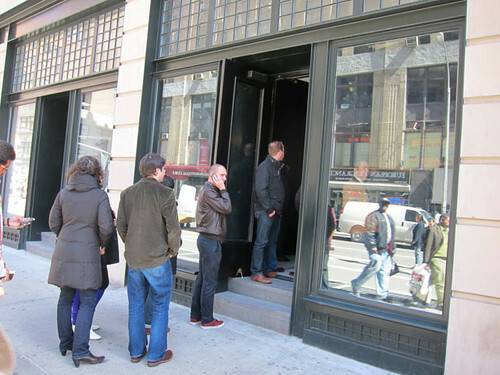 Yesterday was their official “opening day” and I checked in to find out what every Midtown Luncher wants to know (at least of those of us who work around there) are these fancy, hipster hotel lobby subs worth the $9 price tag and the hype. This new sub shop comes from the owners of the popular No. 7 restaurant in Fort Greene. According to Thrillist, one of the chefs worked at a Subway once, but this place is no subway. There’s no building your own sandwich (and there is no $5 sandwich either!) Instead you’re left to choose from their own fancy sandwich creations, designed and tested to be better than anything I could think of. For example: Ceviche (Cucumber, Red Onion, Avocado, Fried Hominy, Leche de Tigre Mayo), Roast Beef (Romaine, Pickled Blueberries, Doenjang, Smoked Gouda), Braised Lamb (Yogurt, Texas Caviar, Romaine, Pappadam). Like I said, not your ordinary sub shop here. On my opening day visit, there was a line out the door and people packed inside waiting for their food. I was too claustrophobic to stand shoulder to shoulder in such a small space, so I waited outside after ordering. My lunch buddy and I waited a total of 25 minutes (20 of that was after ordering) and the line got even longer after that. It’s not Shake Shack wait times, but still not ideal for most office people who only have an hour for lunch. I’m assuming lines will die down once they buzz wears off. By the way, there’s no real space to eat inside, especially with the crowd. However, beautiful weather approaches and it’s not too far from Madison Square Park. My first impression: the sub looks tiny. One half doesn’t seem much bigger than my computer mouse (length & width and 1.6x the thickness). Luckily it tasted good. The Braised Lamb with shredded tender meat was the favorite of the two we ordered. The Turkey Cubano had a layer of some kind of mashed up pâté-like meat with what tasted like a wine or alcohol zing to it. Fancy sandwiches they are, yet still greasy and full of flavor. Oh and my last impression: the sub is tiny. After discussing with my friends and co-workers who’ve eaten here this week, the worthiness of their $9 (around $10 after tax) sub is debatable. They say it’s tasty, but small and possibly overpriced. I think we’ve gotten so used to the $5 foot-longs that we’ve forgotten how to differentiate the value of a sub and the value of quality food. Plus $9 really isn’t that much to gripe about in the big city. Haven’t I bitched about a few things that cost $9 in my previous posts (Enchilada at Great Burrito, Katsu Curry at Tebaya)… and those were at divey spots. As far as the size of the No. 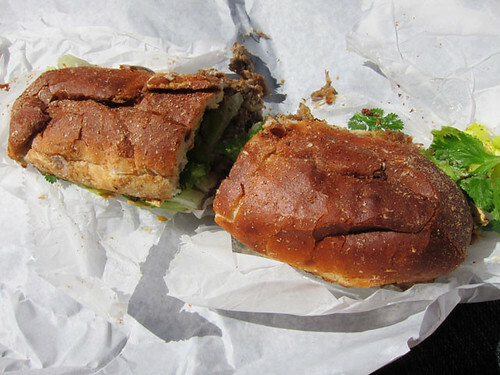 7 sub, you won’t get stuffed, but it’s enough to be satisfied. Anyway, you trying to be a fatso? So do I think No. 7 Sub is worth it? Yes. Other than having no patience for lines or waiting, the sandwich is tasty enough. As for the value, I like to think I’m a fortunate person to be working in Manhattan and can afford to spend a little extra on lunch… at least once in a while. Live your life. Experience things you want. Otherwise you might die tomorrow without ever knowing what a $9 sub is like… or it’ll just end up on your bucket list. Posted by Jason Lam at 10:00 am, March 26th, 2010 under Flatiron Lunch. Given that Lenny’s charges $9 for a sub, this should be worth a try. funny, i went yesterday too, but went early since i had a meeting at 12. i got there around 11:40 and already 2 guys were waiting in front of me, i thought they ordered but we waited a good 5-7 before they started taking orders, eventhough they supposedly open at 11:30.
i got the ceviche. it was good, the fried hominy gave a good crunch. for $9.80 it was pretty small and not super filling. i skipped the $2.50 chips or $3 cookie, seemed like a ripoff. also heads up the place is actually on Broadway, not connected to the Ace Hotel Lobby on 29th street. I saw this post yesterday and then it vanished?? time to put the drugs away??? Lol I swear I saw it Zach… Jason…. Someone. Dang. I was hoping no one noticed. Now I’m going to get whipped. Good thing Zach’s in L.A.
Maybe D has a sense of deja vu or they briefly accidentally posted it yesterday? I don’t like puny and fancy sandwiches but not against trying it. Maybe if the lines are gone. ohh..i see regular turkey on there…i guess it’s pork? 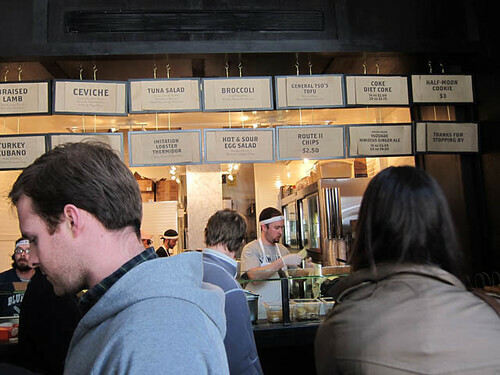 - No close lunch to go with Stumptown Coffee? There’s the Breslin Bar right next door. Don’t want to sit and order from wait staff? Across the street is an incredible Indian hole-in-the-wall, Chandni Food. A lot of people who pray in the mosque next door stops by after services for a bite. Dozens of Muslim customers a day can’t be wrong! - Why does it take so long to make a sandwich? When you have only X number of staff assembling food, and 5 times the number of people placing orders (even at 1 sandwich per person), your staff can only assemble so many sandwiches within a short time period so things are guaranteed to slow down. There’s a reason universities devote whole departments to study assembly line strategies. 9.80 is definitely a bit expensive, but looking at the sandwich in comparison to what you get/pay for at ‘wichcraft, this is definitely a better value. 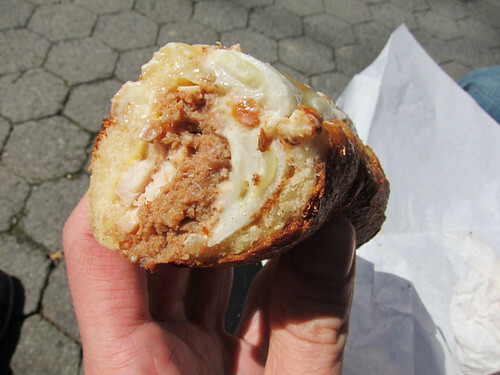 The sandwich was unique, seemingly designed to stimulate a wide spectrum of textures and flavors. A base of lemony ceviche (not sure what type of fish) was covered in crisp cucumbers, avocado, red onions and micro-greens. The crunchy, fried hominy offered a nice textural counterpoint to the softness of the rest of the ingredients while adding a slightly corn-y aftertaste to the sandwich which marinated with the fishy finish of the ceviche itself. I didn’t really taste the advertised “Tigre de Leche” mayo, beyond a slight creaminess. The bread was also quite good, with a dark brown crust and a nice bite, it clearly makes a strong sandwich bread. Are those people all family? They kinda look alike. Did anyone check out the ingredients for Hot and Sour Egg Salad? What is GLOOP??? If it has anything to do with Gwynth Paltrow, I’m staying away. No. 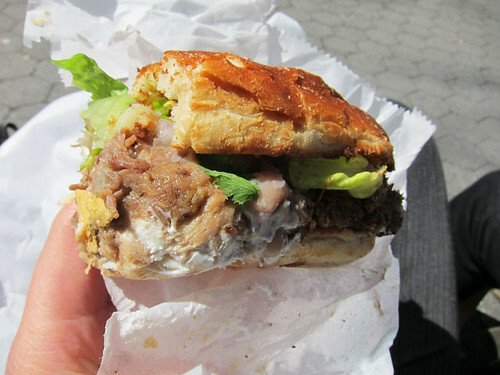 7 in Fort Greene is a personal favorite, so its mandatory that I visit this sandwich shop. I don’t have a choice.